In a large, nonreactive bowl, combine the mangos, onions, jalapenos, ginger, sambal, and lime juice, and blend gently. Season with salt and pepper to taste, then use or refrigerate. 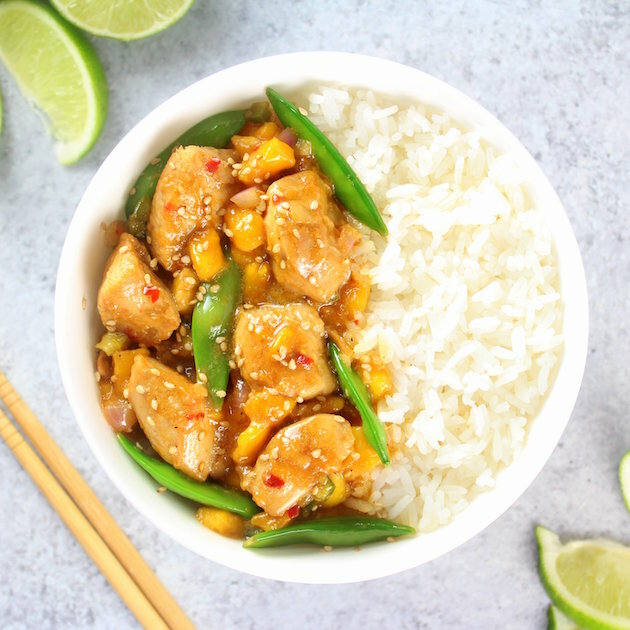 In a large bowl, combine the chicken, sesame oil, cornstarch, and 1 tablespoon soy sauce and mix. Set aside for 10 minutes. Fill a large bowl with cold water and add ice. Bring a large pot of salted water to a boil and add the snap peas. Blanch until they have brightened and lost their raw taste, 1 to 2 minutes. Drain the snap peas and transfer them to the ice water. When cold, drain. Heat a wok or heavy saute pan over high heat. Add the oil and swirl to coat the pan. Add the chicken and stir-fry until just cooked through, 6 to 8 minutes. Add the snap peas and the salsa, along with another tablespoon of soy sauce and the honey. Allow it to heat through. Season with salt and pepper, and if desired serve over your favorite rice or rice noodle. Garnish with the remaining mango salsa and toasted sesame seeds. 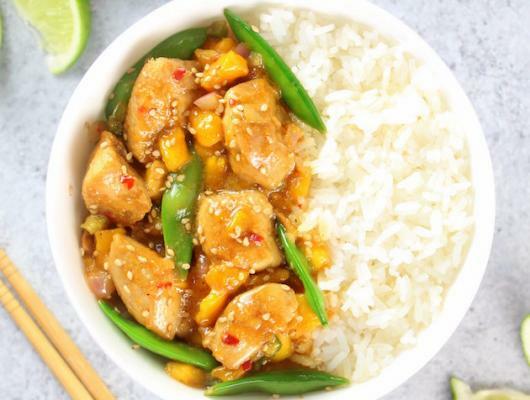 Mango Chicken Stir-Fry with Snap Peas Image from chef Ming Tsai – a healthy, fast, delicious Asian easy weeknight dinner.